The Divvy bike-share station outside Smoke Daddy on Division Street at Wood Street is the fourth most popular in the Wicker Park & Bucktown neighborhoods. Photo by Daniel Rangel. This is an analysis of the station use for Divvy bike-share stations in the Wicker Park and Bucktown neighborhoods (they blend together and it’s hard to know if the club or bar you’re going to is one neighborhood or the other). Numbers represent a discrete trip, from one station to another (or the same station if the trip was greater than 3 minutes, to eliminate “hiccups” where the bike left the dock but didn’t actually go anywhere). Customer means someone who used a 24-hour pass and subscribers are annual members. Gender is self-reported on a member’s DivvyBikes.com user profile. Based on the popularity of the Ashland/Armitage station, which is right outside the Clybourn Metra station – a very popular train stop – I think there might be a residential service gap near Saint Mary of the Angels School. 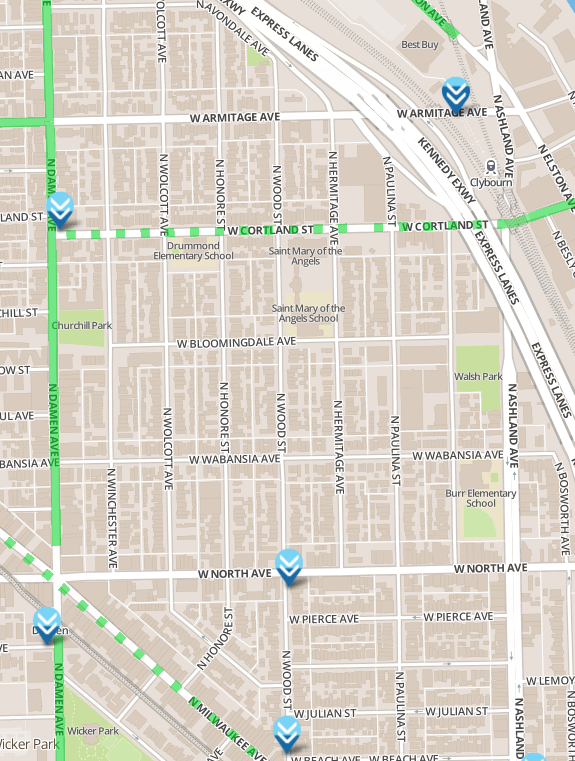 I recommend a Divvy station at Walsh Park this year because the Bloomingdale Trail will open and terminate there. Not all of these stations were online when Divvy launched on June 28, 2013, but I haven’t yet looked into the history to see when each went online. Therefore direct comparisons are not appropriate until you have a trips per day number. Then, seasonality (very cold weather) has its own effect. At the very least, all stations were online by October 29th, with the final addition of the Lincoln Ave & Fullerton Ave (at Halsted) station. Can someone use “R” to make a time series chart on the entire trips dataset so we can find the best cutoff time to eliminate “hiccups”?